My father needed a final resting place. None of the urns at the funeral home sufficed. We knew the perfect person (Shawn Palek) to create an amazing masterpiece for dad. 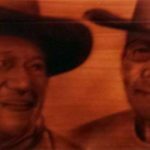 Shawn was given a wood box with the instructions of a western scene since dad loved westerns and if he could work John Wayne into it even better. We knew it wouldn’t be an easy job since he knew my dad and let me tell the final results were better than we could have imagined.